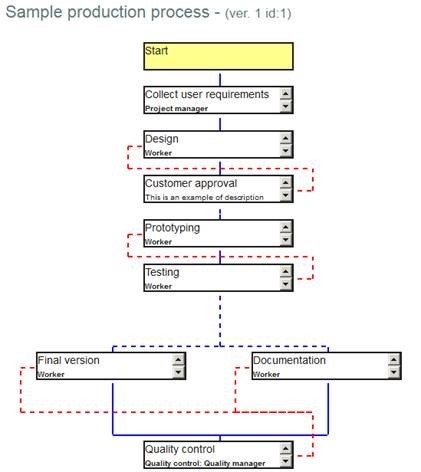 Twproject uses a powerful workflow engine called Flowork based on jBoss jBPM. It can manage many kinds of processes at once. Every process has a “definition”; a definition is a XML file written in JPDL syntax (see the dedicated section). Flowork functionality is actually wider than what is commonly used for Twproject, we will examine features currently relevant for Twproject. In this page there is the list of published fluxes. Flowork supports more than a version per flux. If you load a revised version of the process, new instances will run with new version, while the already running process will continue with the old version. By rolling over transitions you will highlight next steps. In the top part there is a list of running instances, in the lower part there is the list of the last 10 closed fluxes. You normally won’t need any hand management: Twproject manages instances for you. Here you can “force” a step execution by clicking on the “step” button. Doing this you will “signal” the current token to proceed. This may have different behavior depending on how the flux is written. Normally you do not need to do it by hand. If you want to stop a process you can click on “cancel instance”. This will end the flux without completing steps, so you may get “strange” behaviors on the associated task. Usually when you force a process to end you will have to edit the associated task, closing it.